September has not paved the way into the autumn months the way I thought it would, leaves curled on the ground, trees russet and crimson and a coolness in the air. The autumn we’re sold each year, written in thick liner on a Starbucks cup and wrapped in a tartan scarf has not yet arrived. Gloomy skies invite thundering rain so hard it soaks through my boots rather than a gentle frost on the pavements to slide upon. You could say I’m a little perturbed, ready to envelop myself in thick knits and blankets till March when the weather is still holding onto those last few days of summer. I bought autumnal candles in crisp apple and an intriguing white pumpkin scent, but even the flickering flames could not make it feel like the seasons had turned. So I made a sweet spiced loaf instead. 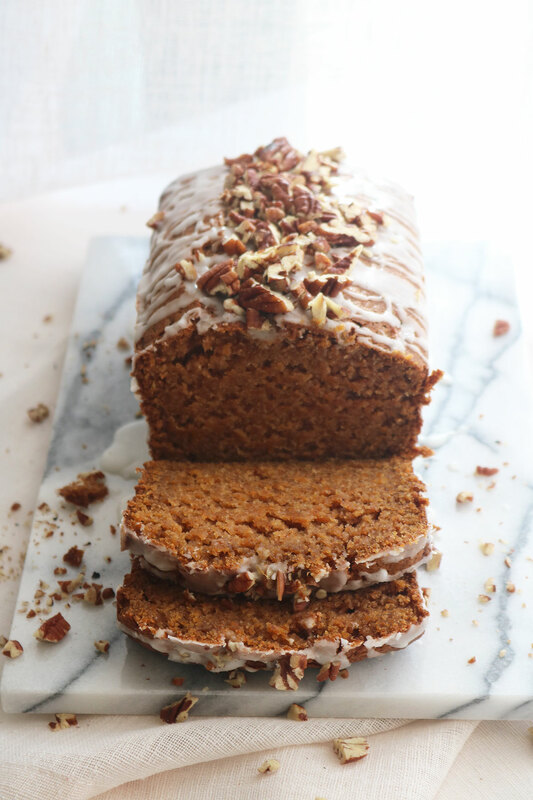 I’ve made a pumpkin spiced loaf before, but I’ve been on such a sweet potato kick recently that I was curious to see how the change in texture would fare in a similar bake. Pumpkin puree is rather smooth but it’s orange hued potato cousin is chunkier and yields a softer, more cake like result. With leftover unseasoned mash in the fridge, I stirred together the most autumnal colour of cake I’ve ever made, the hue coming through as a batter and even when cooked. Sweet spices naturally enhance the flavour, especially cinnamon, and as I took a lick of the spoon, realised it is far closer in taste to a pumpkin spice latte than my previous loaf. It bakes slowly, filling your kitchen with the scent of autumn the way a candle never could and continues to do so as it cools. 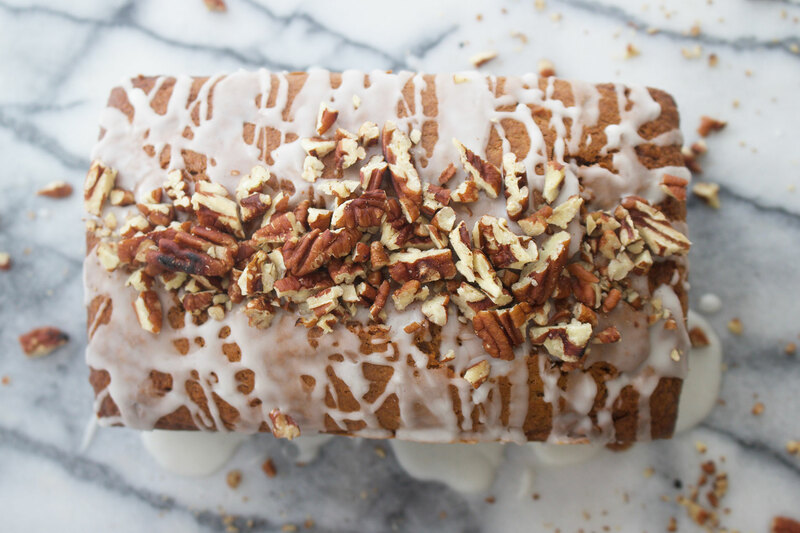 A quick, vanilla-speckled glaze gives the loaf a sweet tang and toasted pecans offer bite to each dense and soft forkful. Today as I walked home from work, my footsteps crunched under an amber-coloured leaf and I smiled a little. 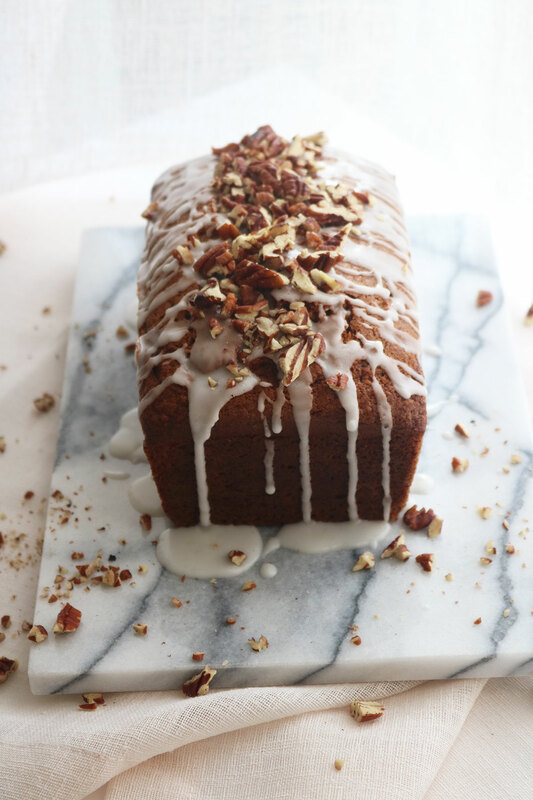 Perhaps all the seasons needed was a slice of sweet potato loaf to be persuaded into changing. Tip: To make an easy sweet potato mash, peel 400g of sweet potatoes and cut into chunks. Cover with water in a saucepan and simmer on a medium heat for around 10 to 15 minutes until tender. Drain then mash well. To use in this recipe, ensure the mash has cooled enough so that it won’t scramble the eggs. Preheat the oven to 180oc/160oc fan and grease and line a 2lb loaf tin. In a large bowl, whisk together the sweet potato, eggs, greek yoghurt, vanilla and vegetable oil until smooth. In a separate bowl, whisk together the remaining dry ingredients then carefully fold into the sweet potato mix. Pour into the baking tin and bake for 70 minutes until a skewer inserted in the middle comes out clean. Cool the loaf for ten minutes then take it out the tin and leave to cool completely on a wire rack. To decorate, toast the pecans in a frying pan on a low heat for a few minutes until fragrant, taking care not to burn them. Roughly chop and set to one side. To make the vanilla glaze, whisk the icing sugar, vanilla paste and water together until smooth then drizzle over the cake using a spoon. 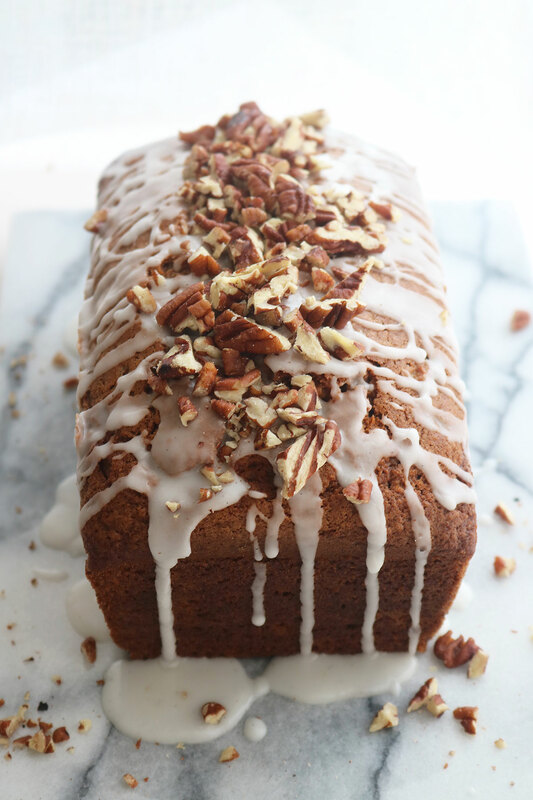 Scatter over the toasted pecans then cut the loaf into slices and serve. The loaf will keep in an airtight container for up to five days. I love sweet potatoes and vanilla, so I know I will like this dessert! This sounds sooo good! I love sweet potato, especially at this time of year. I’ve never used it in baking but I bet it’s great with that sweet flavour. 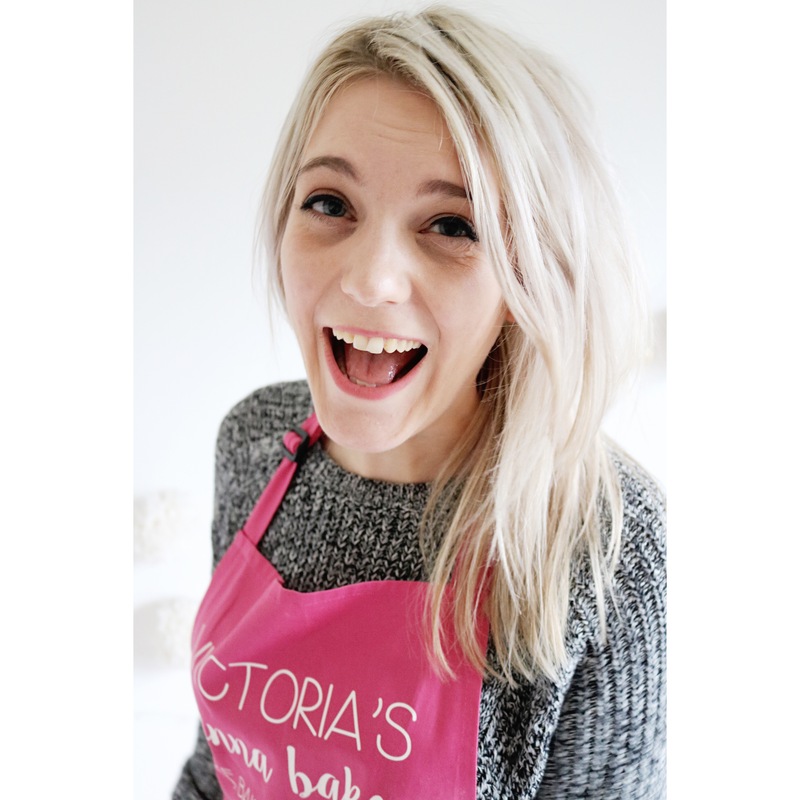 Need to do some Autumn baking for sure! I’m not going to lie Erin, I considered this a breakfast item most days after I made it! Perfect for PSL addicts!